Enjoy reading and share 83 famous quotes about Mistresses with everyone. “Men these days expect their wives to be as dazzling as their mistresses." That's the Beatles' story, isn't it? That's Yoko's story, that's what I'm saying now. Produce your own dream. If you want to save Peru, go save Peru. It's quite possible to do anything, but not to put it on the leaders and the parking meters. Don't expect Jimmy Carter or Ronald Reagan or John Lennon or Yoko Ono or Bob Dylan or Jesus Christ to come and do it for you. You have to do it yourself. That's what the great masters and mistresses have been saying ever since time began. They can point the way, leave signposts and little instructions in various books that are now called holy and worshipped for the cover of the book and not for what it says, but the instructions are all there for all to see, have always been and always will be. “So, " Nathan said, attention focused on Adrian, "now that Vasilisa's graduated, what are you going to do with yourself? You aren't going to keep slumming with high school students, are you? There's no point in you being there anymore. " "I don't know, " said Adrian lazily. "I kind of like hanging out with them. They think I'm funnier than I really am. " "Unsurprising, " his father replied. "You aren't funny at all. It's time you do something productive. If you aren't going to go back to college, you should at least start sitting in on some of the family business meetings. Tatiana spoils you, but you could learn a lot from Rufus. " "True, " said Adrian deadpan. "I'd really like to know how he keeps his two mistresses a secret from his wife. " Want to see more pictures of Mistresses quotes? 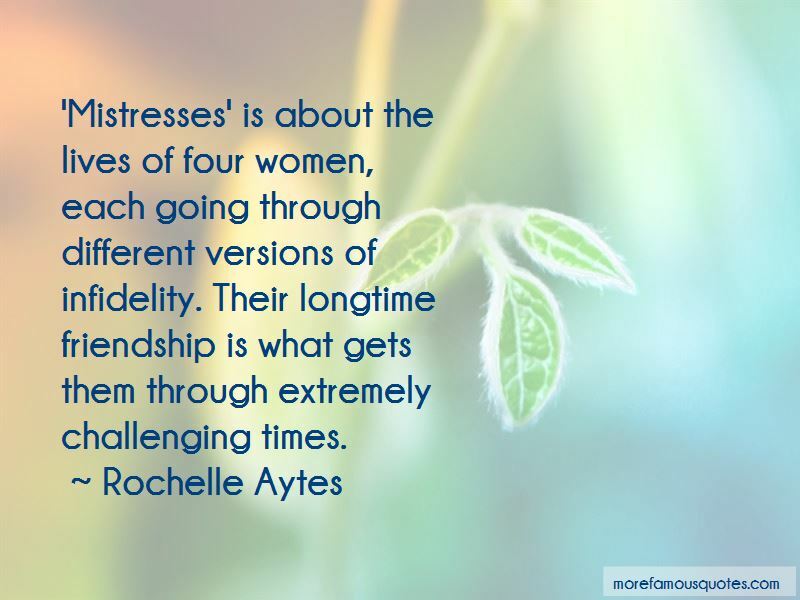 Click on image of Mistresses quotes to view full size.